JFL leaders Sagawa Kyubin SC were twice pegged back from being a goal in front and eventually had to settle for a 2-2 draw in their match at Honda FC on Sunday. It was star defender Masayuki Ishii who proved the hero for Honda, with an 89th-minute equaliser that prevented Sagawa from going four points clear at the top of the table - but they do remain two points ahead of their nearest challengers as a result of Takuya Kimura's shock winner for Mitsubishi Mizushima, midway through the first half of their match with second-placed Rosso Kumamoto. All of which leaves the top of the division a little more compressed than it was prior to the weekend and FC Gifu's defeat of Gainare Tottori on Saturday. 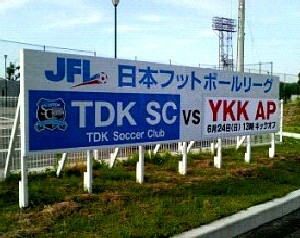 And YKK AP made it three wins in a row to stay fourth after they beat TDK SC. The other main movers in the top half of the table were Alo's Hokuriku and JEF Reserves, both of whom picked up their expected three points against strugglers FC Ryukyu and Arte Takasaki respectively. In the other two matches, Ryutsu Keizai University underlined the great improvements made by their club this season with an excellent 3-1 defeat of Yokogawa Musashino - a result that would have been more or less unthinkable only a year ago - while Sony Sendai continued their own recent climb up the rankings. Motoki Kamegabuchi's goal in the dying seconds of their match at FC Kariya gave the Tohoku side a 2-1 win, their fifth victory in a row and a record that makes them the distinctly unexpected form side in the division.